The building of a House of Industry in Kilkenny was proposed in 1787 as a place "where the old and infirm may always find an asylum, and the lazy and incorrigible be kept to hard labour and discipline". No progress was made, however, but the idea was resurrected in 1805 when a donation of £50 was offered towards the cost of setting up an establishment. In 1809, George Bryan of Jenkinstown offered a large house in Patrick Street for the proposed establishment, with local architect, William Robertson, acting as a consultant. Again, nothing resulted, but the following year Robertson produced plans for a House of Industry which included a hospital, four classed wards for male and female vagrants, four classed wards for the industrious poor, two lunatic blocks, and two punishment blocks for solitary confinement of the miscreants. The estimated cost of the scheme was around £8,000. Building work started in 1810, but progressed slowly with the building not ready for use until May 1814. The first Master and Matron were Andrew Neelands and his wife. Sadly, Neelands died within a few months of taking office but his wife remained in post, with Neelands' nephew, Andrew Bustard, taking over as Master. Inmates in the workhouse were occupied in spinning yarn, and producing cotton wick. By 1826, there was a school operating on the premises. During an outbreak of cholera in 1832, the site was taken over for use as a cholera hospital with a burial ground being sited nearby. Co. Kilkenny: Aharney, Balleen, Ballybraggett (3), Ballycallan, Blackrath, Castlecomer (4), Castleinch, Clomanta (2), Coolchraheen, Danesfort, Dysart (2), Eirke (2), Freshford (2), Gowran (2), Jerpoint (2), Kilkenny (9), Kilmadum, Powerstown (2), Shankhill (2), Thomastown (3), Tullarean, Urlingford (3). The Board also included 15 ex-officio Guardians, making a total of 62. The Guardians met each week at noon on Thursday. The population falling within the Union at the 1831 census had been 115,074 with divisions ranging in size from Balleen (population 1,629) to Kilkenny itself (23,741). The new Kilkenny Union workhouse was erected in 1840-1 on a ten-acre site on Henron Road, at the north side of the railway station in Kilkenny. Designed by the Poor Law Commissioners' architect George Wilkinson, the building was based on one of his standard plans to accommodate 1,300 inmates, making it the country's fifth largest workhouse after the two Dublin Unions, Cork and Limerick. Its construction cost £9,700 plus £2,050 for fittings etc. The workhouse was declared fit for the reception of paupers on 24th March 1842, and received its first admissions on 21st April. The site location and layout are shown on the 1930s OS map below although by this time the workhouse had ceased operation. The buildings followed Wilkinson's typical layout. An entrance and administrative block at the north contained a porter's room and waiting room at the centre with the Guardians' board room on the first floor above. The main accommodation block had the Master's quarters at the centre, with male and female wings to each side. At the rear, utility rooms such as bakehouse and washhouse connected through to the infirmary and idiots' wards via a central spine containing the chapel and dining-hall. During the famine in the mid-1840s, sleeping galleries and sheds were erected, and houses hired, to accommodate an additional 600 inmates. Some fever patients were sent to the County Fever Hospital, part of which was hired for workhouse use. Patients were also treated at the workhouse itself. In 1853, parts of the large Kilkenny Union went to form the new Unions of Castlecomer, Thomastown, and Urlingford. At the end of 1921, a conference in Kilkeeny decided to close all the county's workhouses, with the Kilkenny site planned to become the central hospital for the county, and Thomastown a County Home for the aged and infirm. 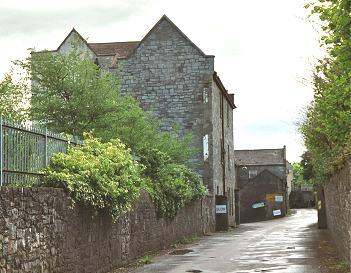 The surviving workhouse buildings at Kilkenny were later used as a council depot. A shopping centre now covers the site. Kilkenny County Library, 6 John's Quay, Kilkenny, Co. Kilkenny. Holdings include: Guardians' minutes (1842-1922, with gaps); Master's report book (1910-1913); Letters from the Local Government Board (1893-1913). National Archives of Ireland, Bishop Street, Dublin 8. Holdings include: Register of births (1899-1919).